My daughter just graduated from the highest class level at Goldfish Swim School. Does that mean her time there has come to an end? Not just yet … she's joined the Goldfish Swim School Swim Force! The Swim Force is a program for those kids who have advanced through all the swimming classes that Goldfish has to offer. It is the school's in-house swim team. Team members train each week to participate in the Swim Force's swimming meets that take place four times per year. It is a great way to transition kids from learning to swim towards participating in swimming as a sport. Especially for those who may be athletically inclined to pursuing joining a competitive swim club or being a part of high school and college swim teams. 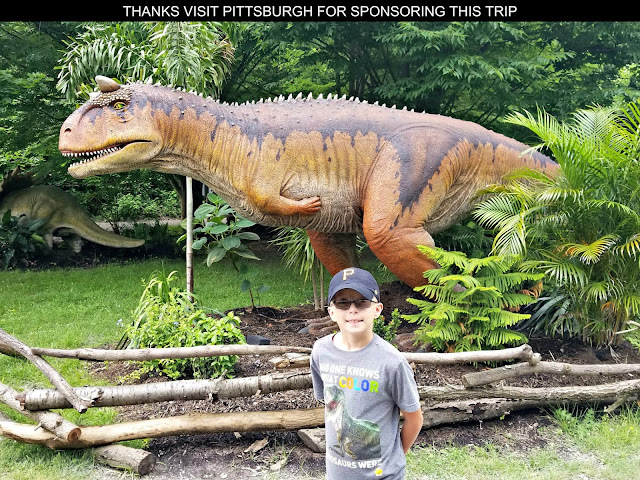 My daughter really is into swimming so we absolutely wanted to give her the Swim Force experience to see if this is an activity she really wants to take to the next level and being participating in at a competitive level. Instead of going to a once per week class, Swim Force swimmers participate in a once per week workout. This workout is double the length of time and distance in the pool than the normal Goldfish Swim School swimming class. Swim Force workouts are an hour instead of half-hour long. Plus Swim Force members swim the length of the pool during their workouts instead of across its width as is done in swim classes. Your kids is absolutely going to get some exercise during a Swim Force workout! Swim Force session sizes are larger than the average swimming class with 10 to 15 kids normally participating in a workout compared to the maximum of four per class in swimming lessons. 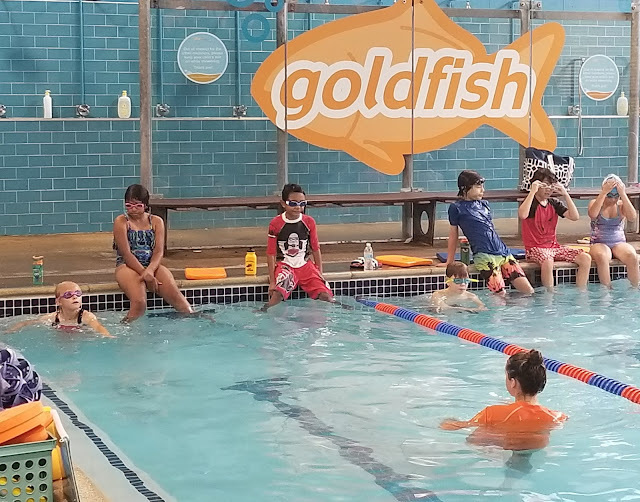 This is balanced out though with their being three to four instructors helping out the swimmers during a workout so there is still approximately a 4 students to 1 teacher ratio when it comes to participating in the Gold Fish Swim School Swim Force. These sessions are all about taking kids who have their basic swimming skills down pat and helping them to master strokes, improve their speed in the water, and introduce them to the competitive aspect of the sport. Each Swim Force member is assessed by instructors and assigned to a specific pool lane based upon his or her skill ranking where he or she will be interacting with other swimmers of similar ability. This helps swimmers avoid becoming overwhelmed or feeling defeated by Swim Force members who have may more advanced skills. Children 5 to 12 years old can join the Swim Force anytime throughout the year – there is no “season” like in other sports. You don't have to have taken lessons at Goldfish either, any kid can join Swim Force provided they can pass tests to determine if they’re ready. It is one day per week! If your family is like mine I'm sure you always seem busy so the once-a-week Swim Force workouts mean no overextending your schedule with a commitment to a team activity that has multiple practices per week. Children can be involved in swimming yet still have the flexibility to do other activities as well. Workouts are for one hour! The extended time of Swim Force workouts versus the normal half-hour Goldfish swimming lesson times gives kids extra time spent in the water. 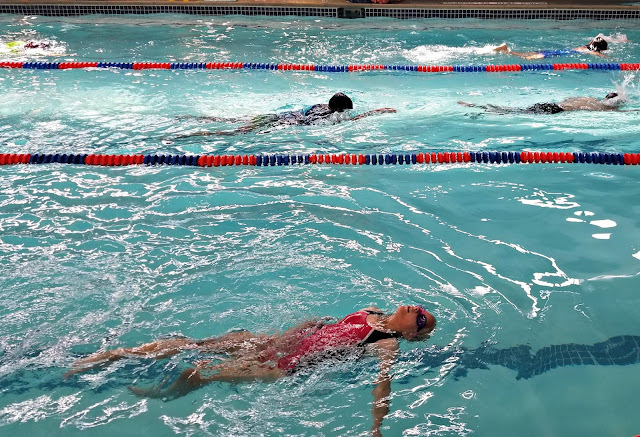 And while traditional swim lesson classes may be over, swimmers are still getting lots of individualized attention from coaches who are in the pool with them during the Swim Force workouts. Socialization! Kids build relationships and learn about working together when they are a part of Swim Force. It is the opportunity to compete against others as well as to feel what it’s like to be on a team. 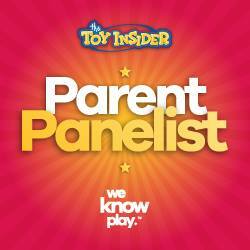 Builds Confidence! The more often kids practice at something the better they will become and swimming is no different than anything else. Being part of the Goldfish Swim School Swim Force allows children to gain confidence not only in their swimming abilities, but in themselves as they see their accomplishments over time. The quarterly swim meet, which is voluntary to participate in, allows kids to showcase their skills in a team setting meant to build confidence no matter the skill level of the swimmer. Improves Athletic Skills! The Swim Force program is designed to prepare kids for participating in team sports and competitive swimming. It focusses on helping swimmers becoming more proficient in both technique and stamina. Coaches will help kids perfect swim strokes for the butterfly, backstroke, breaststroke and freestyle – and also learn new racing skills including turns and finishes. If your child has an interest in doing swimming as a sport, Swim Force will get him or her up to speed to move up to a competitive team when he or she has outgrown their Goldfish Swim School years. My daughter has just started Swim Force and hasn't been in it long enough to participate in a swimming meet yet. She was initially shocked at how many of the kids on the Swim Force outpace her right now after she was always the star of all her swimming classes. I've been impressed on how she has taken that on as a challenge to improve herself to be competitive with them and it looks like she is really enjoying the Swim Force workouts. 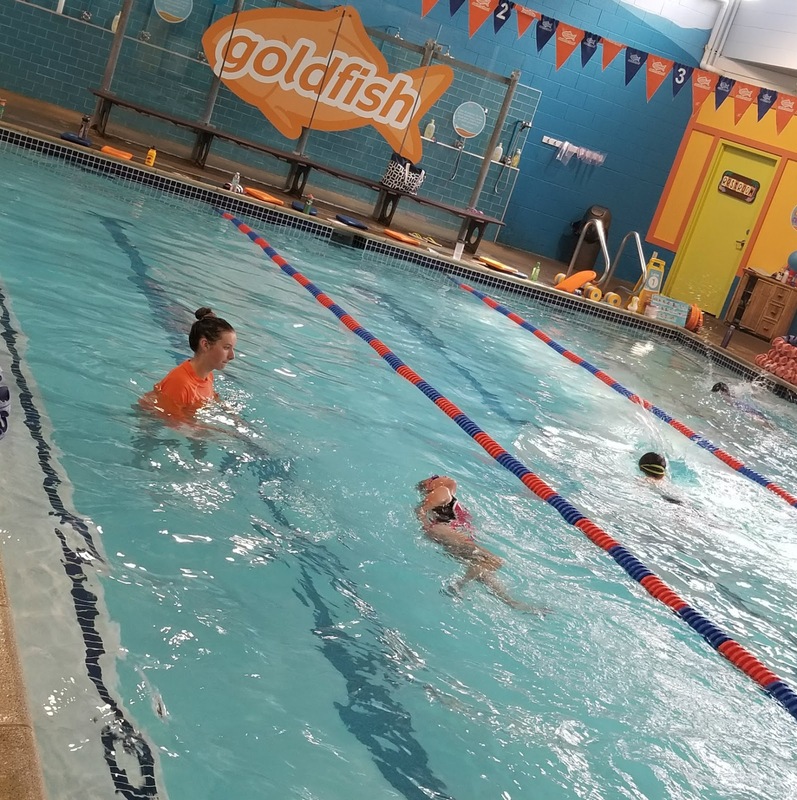 Stay tuned for more updates as she keeps swimming at Goldfish Swim School and prepares for her Swim Force swimming meets! A Geek Daddy is a Goldfish Swim School brand ambassador. 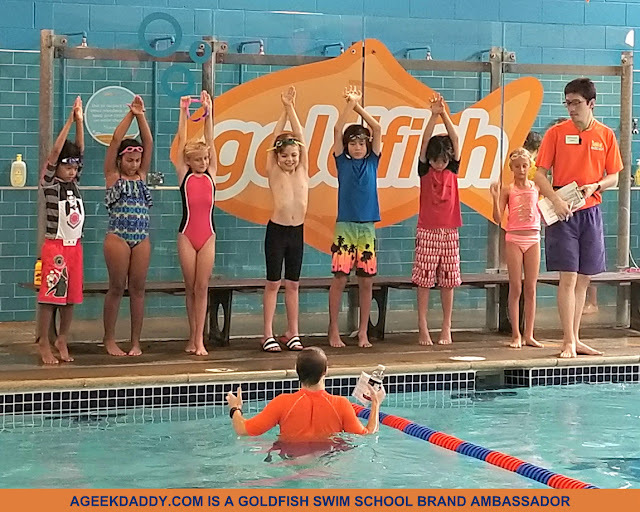 In exchange for providing publicity through this blog and its social media outlets, I receive free products and services from Goldfish Swim School. Opinions expresses are always honest and my own.